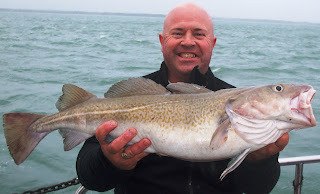 Mid November and the cod fishing has really got going and its time for the British Cod Champs on the Isle of Wight. 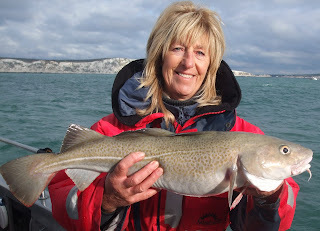 Day 1 and the weather was good enough to allow us to fish South of the Needles. We managed 3 fish with best just under 17lbs falling to Rene van Oevelen that turned out to be third heaviest of the day. One boat had 9 fish so we were somewhat off the pace. Day 2 saw strong Southerley winds and we were confined to the Solent - not our favorite grounds for sure. Only one fish for Pete "Geeze" Bailey up to lunchtime a monster just short of 30lbs (well about 28lbs short to be precise!). We had a move and Geeze joked that he only needed another 4 to win! In the last hour geeze so nearly did it catching 3 and dropping one! 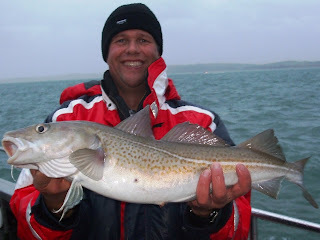 His 4 cod with the horrible weather, copious weed and scarce bites rates as the finest angling achievement we have seen on Silver Spray. Max Everrett also got on the score sheet giving us 5 fish on day 2. 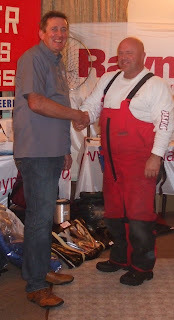 Geeze ended up in third place overall with 5 fish to 37lbs while the 1st and 2nd placed anglers also had 5 fish totally 44lb each. 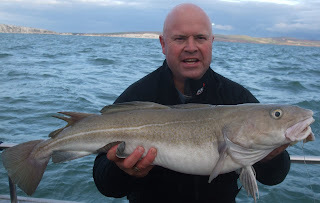 Silver Spray ended up 3rd on number of cod with 8 fish. Winning boat was Becky M.
Sorry but no picture of Cod 4 on day 2! With wind in the north for the day Sam ventured over the island for the day. Its not surprising that when he got there about 15 other boats had the same idea. 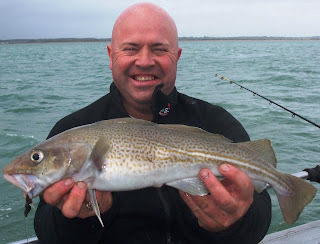 After a couple of hours he moved back to dolphin sands where the catch consisted mainly of dogfish but with a whiting and even a couple of bream showing up. 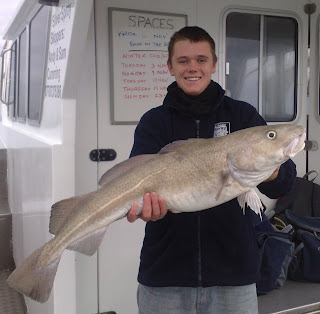 Over the slack Sam managed to pick out his first winter cod ever, weighing in at 17lb. Even if the anglers didn't catch it they still got to enjoy eating the fish as they took it on at the end of the day. Today we set off for a late season bass fishing trip. The forecast wasn’t great for the afternoon but there was a “hole in the weather” forecast for the morning. Conditions were fine when we arrived at our bass mark about 20 miles offshore. 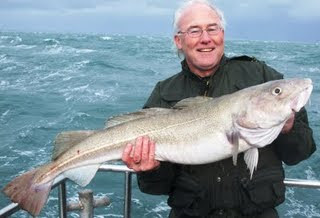 The next hour and a half saw more than 20 bass to 7lb come over the gunnels with all fish being in excellent condition. 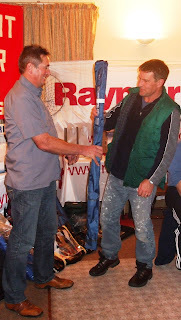 Then Dave Lynes from Poole managed to get a sidewinder lure hooked into his hand. The hook point was completely buried so there was no alternative but to head back to Poole so that Dave could head off to hospital. The lads were very good natured about the interruption. 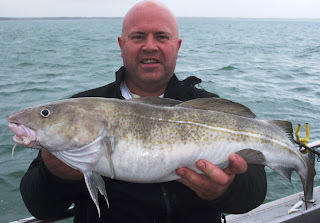 Despite the worsening weather we decided to fish the slack water on a mark 3 miles east of Old Harry to try for a cod or whiting. At first we had a steady stream of pouts and dogfish. 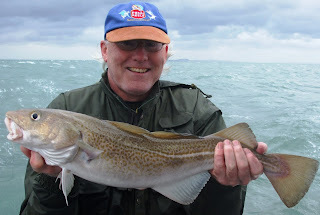 Then Nick Colbert, from Bath, hooked a heavier fish that turned out to be a 7lb cod, our first inshore fish of the winter. 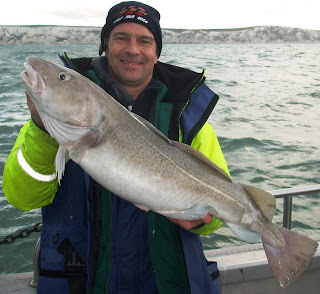 Next fish up was a nice whiting, also our first of the winter. 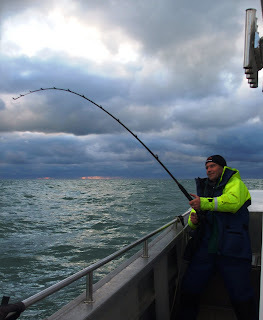 Then Nick’s 10 foot bass rod bent into a much heavier fish. 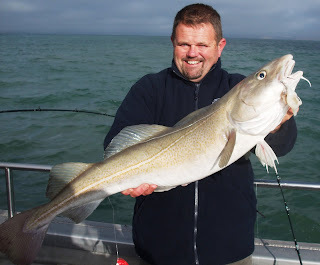 After 10 mins a large cod appeared from the depths and a 23lb beauty was soon in on the deck having fallen for a squid bait fished on a single 4/0 hook. Nick’s bag included 2 bass to 7lb as well as the two cod!